There will come a time least once in your life, when you will need to ask yourself, ‘what is the purpose of my existence’? This question might announce itself one random day while you are deep in thought, or it might come about while you are sitting in a contemplative state of lonesome misery, either way the question remains the same, ‘why am I here, and what is my life all about’? Usually, and I have noticed this from my own personal experiences, if you are indeed asking yourself a question or two like the ones I have just mentioned, you are in a period of intense inner growth and what we might refer to as spiritual expansion. Becoming more aware of what we observe as unconscious and recognizing certain behaviours not only in other people but in ourself, that which we did not notice in the past, is in part the process of our spiritual awakening. When we begin to recognize behaviours of other people, in a way that no longer keeps us guessing about who they truly are, we are indeed a witness to our own evolution. The question then becomes, can we integrate those people and will it be possible for them to remain a part of our life, now we have this new state of consciousness? Some of these Soul contracts will in fact expire and you both will part your ways. It isn’t easy to let people go, but most of the time the separating will come organically and with no hard feelings. Spiritual progress is very often a slow and cautious process, there is no fast lane or quick action to take to get to the finish line any sooner. You must remain patient and move with the motions of what appears to be divine guidance, as it comes to you. Change is inevitable and can not be avoided, unless you resist and remain tied to your Ego. Conscious awareness is change that comes about as you elevate the vibration of your internal energies. As you begin to elevate, there will be a natural desire to be with people of the same vibration, you will crave for something different. We humans do not adjust or adapt to change well, we are hard wired to ‘remain as is’ at all cost. But change is necessary, to what degree is entirely up to you. When you expand your conscious awareness, your external existence will find itself in disarray if it doesn’t change with you. 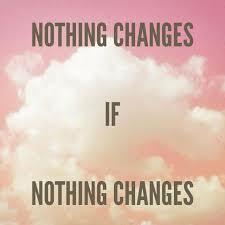 Life is meant to be refined and revised, change is indeed a part of life. Resist the urge to resist.